Pruitt’s media strategy is right in line with that of his boss. During the 2016 presidential campaign, Donald Trump eschewed mainstream media outlets ; it's a pattern his administration has continued since the election, favoring conservative  and right-wing media outlets  that are friendly to President Trump's agenda. By following the same approach, Pruitt has been able to push misinformation, avoid tough questioning, and appeal to the president’s political base. Three appearances on Fox & Friends on March 28 , April 13 , and May 17 . Two appearances on Fox News Sunday on April 2  and June 4 . Two appearances on Special Report with Bret Baier on February 21  and June 1 . Two appearances on The First 100 Days on February 28  and April 27 . One appearance on Hannity on March 28 . One appearance on The Story with Martha MacCallum on June 5 . One appearance on America’s Newsroom on June 30 . One appearance on CNN’s The Situation Room on February 28 . One appearance on CNN's The Lead with Jake Tapper on June 1 . One appearance on MSNBC’s Morning Joe on June 6 . Two appearances on ABC’s This Week on March 26  and June 4 . One appearance on NBC’s Meet the Press on June 4 . Three appearances on Salem Radio Network’s The Hugh Hewitt Show on March 29 , May 11 , and June 2 . Two appearances on Fox News Radio’s Brian Kilmeade Show on April 27  and May 19 . One appearance on SiriusXM Patriot’s David Webb Show on April 26 . One appearance on SiriusXM Patriot’s Breitbart News Daily on June 5 . One appearance on Westwood One’s The Savage Nation on June 1 . Hugh Hewitt has a years-long record  of climate denial: He wrote in a 2011 blog post that “we don’t know” how much humans contribute to global warming or “if it will be harmful or if there's anything we can do about it.” Hewitt also downplayed the threat of climate change in a September 2016 episode of his show in which he said that warming might be "a real problem over 500 years." Brian Kilmeade has denied climate change, both as a host on his radio show and as a co-host on Fox & Friends. On a 2013 episode of his radio show (then called Kilmeade & Friends), Kilmeade suggested  that only “corrupt” climatologists accept human-caused climate change. On the same day, Kilmeade disputed  on Fox & Friends that it is “settled scientific collective thought” that human activity causes climate change. Breitbart.com has a long track record  of pushing blatant climate science misinformation and attacking climate scientists and climate science, calling researchers “talentless low-lives” and “abject liars” and climate change a “hoax.” Breitbart is also a go-to outlet  for fossil fuel industry-funded academics who want to get publicity for their work. 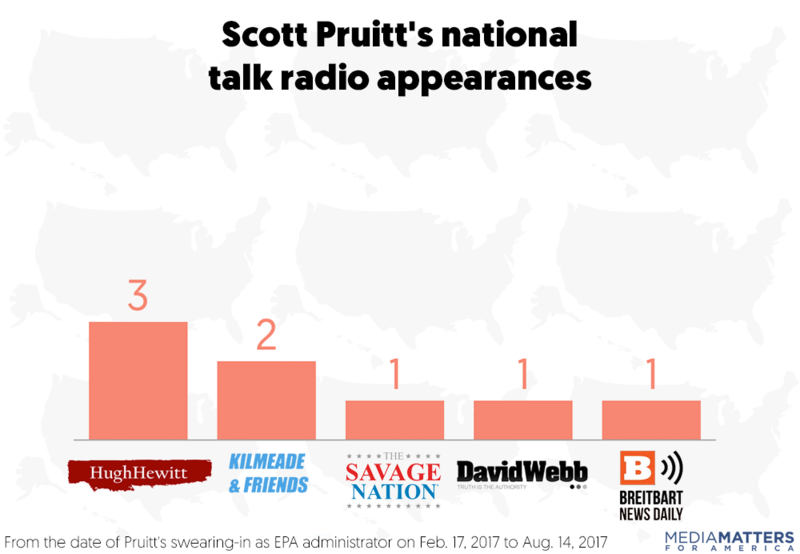 Pruitt’s right-wing radio appearances have extended beyond nationally broadcast shows. E&E News reported  in May that Pruitt appeared on “the local morning talk radio show of a North Dakota blogger who described the Obama administration's EPA as an enemy to the well-being of his state.” ThinkProgress noted  that during a “state listening tour” in North Dakota earlier this month, “Pruitt stopped by the conservative talk radio show What’s On Your Mind to share his thoughts on a number of EPA-related issues.” During that conversation, Pruitt referred to the “so-called settled science” of climate change. And on August 10, Pruitt appeared  on a Texas radio show, Politico reported , where he said his staff will assess the "accuracy" of a major federal climate report that's been drafted by scientists from 13 agencies. “Frankly this report ought to be subjected to peer-reviewed, objective-reviewed methodology and evaluation,” he said, ignoring the fact that the report has already undergone extensive peer review. 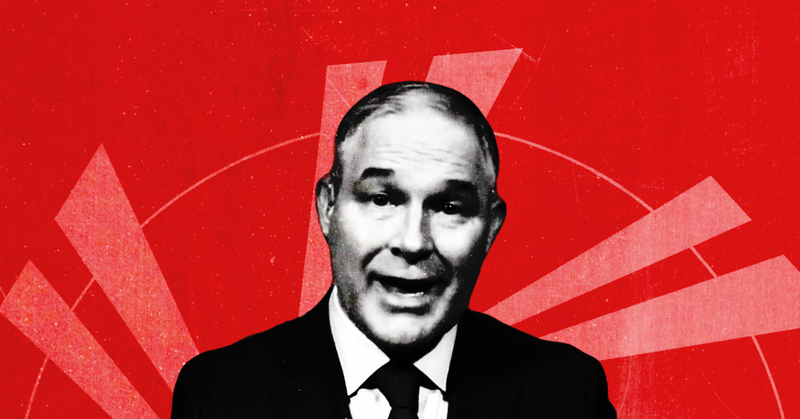 Pruitt also used his appearance on the show to cast doubt on climate science in general. In addition to his June interview on Breitbart’s radio show, Pruitt granted the Breitbart website an interview  in March. Pruitt also sat for a lengthy video interview  in July with the fossil fuel-funded  Daily Caller, another denialist  online outlet. And he gave an interview  in May to The Daily Signal , an online news outlet run by the Heritage Foundation, a conservative think tank that casts doubt on climate change . Four appearances on Varney & Co. on March 29 , May 3 , May 17 , and June 6 . One appearance on Cavuto: Coast to Coast on March 9 . One appearance on The Intelligence Report with Trish Regan on April 12 . 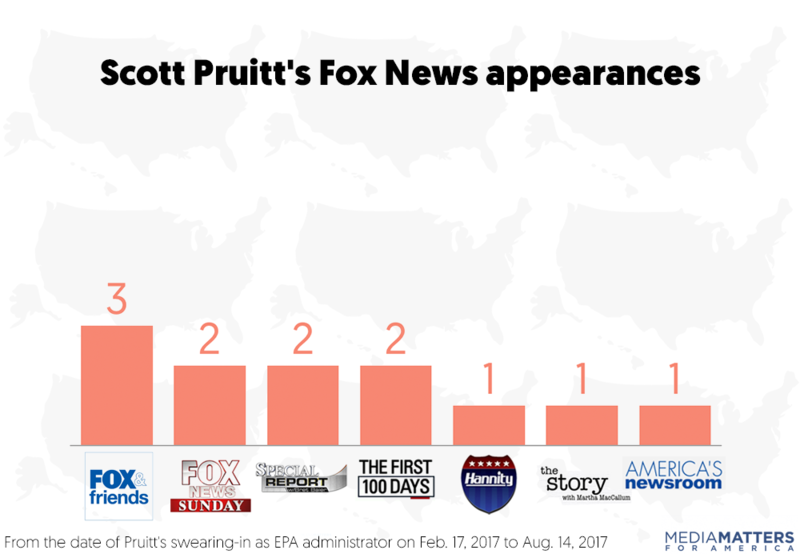 Media Matters searched the following terms in Nexis, iQ Media, and TVEyes to find Scott Pruitt's on-air TV appearances from the date of his swearing in as EPA Administrator on February 17 to August 14: “Pruitt,” "EPA administrator," "E.P.A. administrator," "EPA chief," "E.P.A. chief," "EPA head," "E.P.A. head," "head of the EPA," "head of the E.P.A.," "head of the Environmental Protection Agency," "Environmental Protection Agency Administrator," or "Administrator of the Environmental Protection Agency." 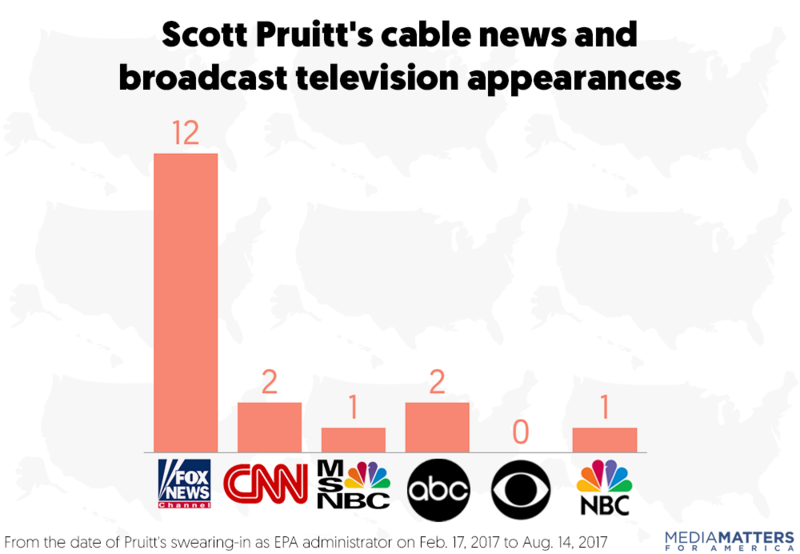 We did not count instances of networks airing Pruitt’s appearance at the White House’s June 2 press briefing . For radio appearances, Matters Matters searched the same terms in Veritone for the top 10 programs in Talkers.com's Top Talk Audiences list  and the following programs that air on SiriusXM Patriot: Breitbart News Daily, David Webb Show, Brian Kilmeade Show, and The Wilkow Majority.